Featuring a largely fragmented and highly competitive vendor landscape, companies operating in the global market for motion controllers benefit from the vast set of application areas across a large number of process and manufacturing industries, observes Transparency Market Research in a recent report. The global market comprises several small-scale vendors across promising regional markets and is likely to remain highly competitive for large companies in the near future as well, unless attempts are made to consolidate the market with the help of strategic collaborations, mergers, and acquisitions. Some of the leading companies in the market are Rockwell Automation, Schneider Electric, Parker Hannifin, and Siemens. The report states that the market will exhibit a promising 7% CAGR from 2017 to 2025, registering a promising revenue opportunity of US$3,013.0 mn by 2025 from US$1641.5 mn in 2016. Geographically, the market in Asia Pacific, which is domicile to some of the leading companies operating in the field of motion controllers, has been a prime player in terms of innovations and technological advancements in the area. Moreover, the increased adoption of smart manufacturing techniques to achieve plant-wide optimization, sustainable production, and data inter-operability across a number of steadily expanding end-use industries has also solidified the region’s position in the global market. Accounting for over 30% of the global market in 2016, the region is likely to hold on to its top spot by registering an impressive 9.1% CAGR from 2017 to 2016. In terms of technology, the segment of general motion controller contributed the dominant share in global revenue in 2016 and is anticipated to expand at a promising CAGR of 7.3% over the report’s forecast period. 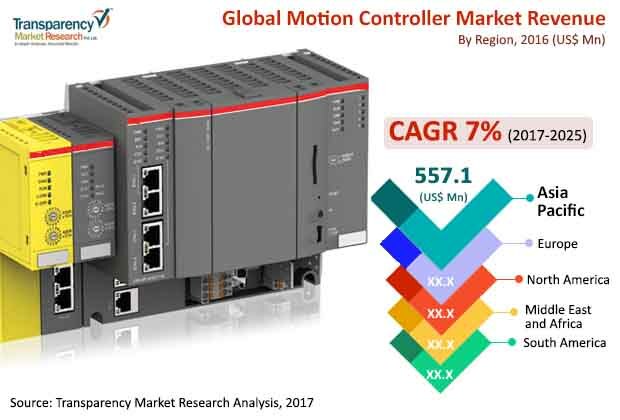 The segment of CNC motion controllers is anticipated to register a decent CAGR over the forecast period owing to the rising adoption of CNC machines in manufacturing and metal industries in developing economies such as Vietnam, Brazil, South Africa, and Australia. The global motion controller market is chiefly driven by the increasing adoption of plant and process automation across industries that are inclined towards establishing smart factories and smart manufacturing processes in their ecosystems as a way of achieving high productivity, efficiency, and process optimization. This is especially true for developing geographies such as Asia Pacific and South America. With increasing investment of government and private bodies in manufacturing and process industries, emerging economies of China, India, Indonesia, and Vietnam in these regions are fueling the adoption of a variety of global motion controllers. The global motion controller market is also driven by a vast set of factors including the need for higher throughput from industries with improved accuracy and greater equipment efficiency and rising concerns regarding the safety of human resources in industries with difficult operation environments. However, factors such as the low availability of skilled labors could hinder the growth prospects of the global motion controller market during the forecast period.